Repeated clampdown on sites such as Facebook and Twitter amounts to violation of civil liberties. The circular issued by the government of Jammu and Kashmir on April 26 suspending 22 social media and instant messaging sites - including Facebook, Twitter, WhatsApp, Viber, among others - is the latest in the long line of what has come to be known an "e-curfew". In the age of "Digital India", internet in Kashmir Valley, the so-called integral part of India, is a rare and precious service, and a good bandwidth is almost a luxury. It's extremely ironical but hardly unexpected that the repeated clampdowns on internet services - both broadband and mobile internet - in the Valley, as well as in areas with even a smattering of anti-establishment political unrest, such as in parts of Gujarat during the Patidar agitations, have become a regular feature of governmental control. The language of the circular, and the repeated use of the word "anti-national", is not only important but in fact instrumental in the issuance of the order that can only be labelled as "draconian". That digital disconnection is being used as a punitive measure against those not officially "nationalist", and as a peculiar form of mass confinement for an entire population, stripping them of basic human dignity and facilities otherwise marketed and promoted obsessively to showcase the 21st century digitised India, is telling. 1/ J&K Govt orders ISPs to block 22 social media services: Facebook, Twitter, Whatsapp, QQ, WeChat, Qzone, Tumblr, Google+, Baidu, Skype..
2/ J&K Govt also blocked: Viber, Line, Snapchat, Pinterest, Telegram, Reddit, Snapfish, YouTube (Upload), Vine, Xanga, Buzznet, and Flickr. Latest figures show India tops the list of countries with the maximum number of internet shutdowns, 26 instances since 2012, with 10 in 2016 alone. The longest among these was the stoppage of internet services in the wake of Hizbul militant Burhan Wani's death, who was killed in an encounter with the armed forces on July 8, 2016. The full restoration of broadband and internet services in Kashmir only happened on January 30, 2017. The latest decision to suspend social media sites has an immediate trigger in the "human shield" incident of the Indian Army that was caught on smartphone camera and posted online. Farooq Ahmad Dar, a shawl-weaver in Budgam, who had in fact defied the call from separatists to boycott the recently held by-polls and had gone out to cast his vote, was picked up by an overzealous Army officer, tied to an Army jeep and paraded for over 10 villages to send out a message to stone-pelters. The video went viral and led to international and national condemnation of this patently illegal act by the Indian Army. 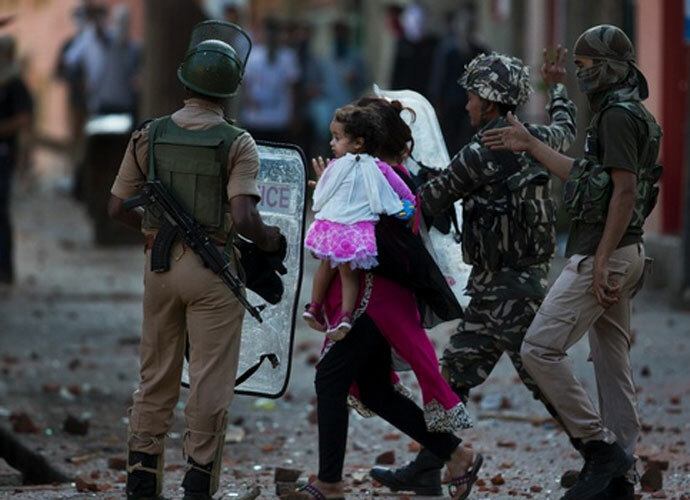 The reaction to this gross error and being caught redhanded committing what has been categorically listed as a human rights violation by the Geneva Conventions of the United Nations, is more clampdown by the J&K government. The PDP-BJP coalition, under the leadership of state chief minister Mehbooba Mufti, is not only clueless as to how to bring the spiralling cycle of violence and protests in the Valley, it is equally insensitive to the political compulsions and disenchantment that's pushing the Kashmiri youth beyond the point of no return. A number of editorials in Kashmiri, national and global publications have pointed out how internet clampdowns constitute an unimaginable violence on the day-to-day lives of ordinary Kashmiris, who are unable to conduct any online transaction, or even communicate with the near and dear ones either within the state or outside. Digital disconnection and denial of proper, high-value bandwidth, at a time when telecom giants are showcasing superhighways of online communication, promising 5G speeds while claiming to provide fastest 4G speeds to the Indian citizen, is nothing less than virtual incarceration for an entire population. Moreover, this disallows the Kashmiri to document, record and instantly share the atrocities committed by the members of the military and paramilitary forces in the Valley. For example, barely days after the video of a CRPF jawan being heckled and assaulted by volatile Kashmiri youth, the "human shield" video and other clippings of CRPF personnel beating up Kashmiri youth surfaced, mostly as a challenge to the official narrative. Several legal experts and those looking at the still nebulous intersection of law and the internet, have said that internet shutdown is illegal and unconstitutional. They have given legal opinion on the issue of misusing the Indian Telegraph Act to order denial of internet services in conflict zones, only to aggravate the trauma faced by those caught in the crosshairs. 9. With respect, reliance by the J&K Govt. on the Telegraph Act -- specifically the 2007 rules, is not only erroneous but unconstitutional. 4/ I'd argue this is unconstitutional: (2) Blocking 22 widely-used platforms cannot be held to be a "reasonable restriction" u/Art 19(2). In addition, it has been shown that internet shutdowns cost India Rs 6,000 crore in lost business and transaction opportunities, a huge amount which nevertheless wouldn't have any accountability or explanation from the authorities. Left without high bandwidth internet services, basic social media outlets to connect to the world, Kashmir is becoming an enormous prison-house of digital incarceration. This is illegal confinement of one's digital selves, at a time when entire lives are lived out online. At a time when the prime minister is pushing cashless transactions and promoting his flagship Digital India project posing with the telecom honchos from India, and social media czars like Facebook's Mark Zuckerberg, his own party, which is in alliance with the ruling PDP, finds no problem - moral, ethical and legal - to strangle the Kashmir Valley virtually, depriving it of the oxygen of digital connectivity. This is hypocrisy at the highest level and an illegality committed by those in power. This needs immediate attention from everyone who thinks basic civil liberties cannot be compromised at any cost.